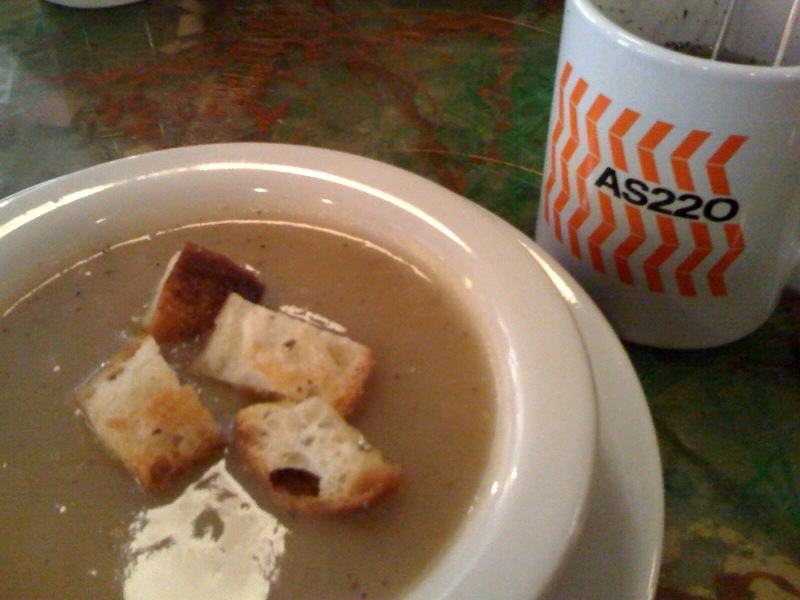 Tasty potato leek soup for a good cause at AS220. With live/work spaces for artists (two vacancies opening this spring) along with their existing repertoire of workshops, studios, galleries, and labs, AS220 is more than a local nonprofit — it is a force to be reckoned with. They even have a restaurant, but clearly this is no ordinary restaurant. The menu consists of an eclectic mix of dishes from a variety of cultures with ingredients derived from local farms and food artisans. Although they are known for their vegetarian and vegan options, they have plenty of dishes for carnivores as well. (They aim, after all, for inclusion). They even provide six month training positions at the restaurant for local teenagers. If the city is to be judged by its Creativity Index, then things certainly are looking up for Providence, thanks largely to AS220. AS220 is the Walmart of art orginizations here in Providence. I’m intrigued by your comment — can you be more specific? Are you referring to just their size or do you feel they are squashing smaller arts organizations in the state?